A chocolate covered strawberry but on a stick! 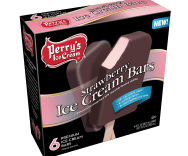 Strawberry ice cream in chocolate flavored coating. MILK, CHOCOLATE FLAVORED COATING (COCONUT OIL, SUGAR, COCOA, SOY LECITHIN, NATURAL FLAVOR), CREAM, CORN SYRUP, STRAWBERRY PUREE (STRAWBERRIES, CANE SUGAR, NATURAL FLAVORS, MODIFIED CORN STARCH, CITRIC ACID), LIQUID SUGAR, SKIM MILK, BUTTERMILK, WHEY, NATURAL FLAVORS, MONO- AND DIGLYCERIDES, GUAR GUM, LOCUST BEAN GUM, CARRAGEENAN, DEXTROSE, CITRIC ACID, BEET JUICE (COLOR).